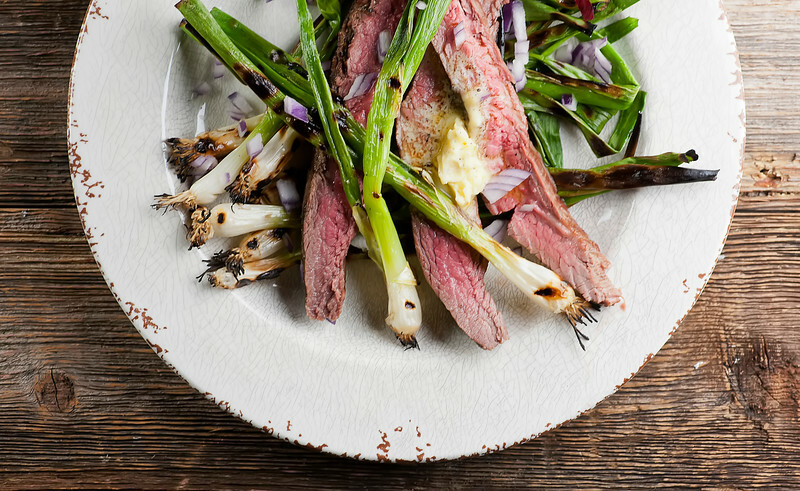 One of the things I like about this recipe for grilled steak and scallions is that it gives scallions the proper love and respect they deserve. They are as good a veggie as their cousins the summer squash and the broccoli and the asparagus and all the other green things that tend to end up on our plates next to our grilled steak. Not that I have anything at all against any of those veggies, but I’m here to tell you that if you give a bunch of scallions a drizzle of olive oil and pop them on your grill until you get a nice char, and then pop them on the plate with some sea salt and some chopped onion and sliced grilled steak and a little glug of butter over the whole thing, you will be lining up next to me in the Scallion Appreciation Society. Ready to give some scallions some love? Let’s make it! First you want to get a lovely flank steak, and marinate it in olive oil, lemon juice and smashed garlic cloves for a few hours. Crank up your grill until it is nice and hot and cook the steak to your liking – we always do about 5 minutes per side to get things nice and medium rare. When the steak is done, you want to let it sit under foil for about ten minutes while all the juices settle in, and this is EXACTLY the amount of time you are going to need to grill up your scallions. (I’m telling you, this steak and scallion supper is Meant To Be.) Toss the scallions with a little olive oil, pop them on the grill – yes, right across the grates – and grill them until they start getting nice little char marks. You are welcome to snip off the little root ends if you want to, but as you can see from my pictures, I just rinse them off well and leave them as they are, roots and all. Once the scallions are done, slice the steak up against the grain and divide the steak and the grilled scallions among your dinner plates. I like to sprinkle a little chopped red onion on top, and give everything a dusting of sea salt and fresh ground pepper. And then, when I am feeling ESPECIALLY decadent, I put a nice dollop of salted butter right in the center. It melts into the steak and scallions and the angels sing and I hear harp music and everything is right with the world. So go give a bunch of scallions some grilling love! Put steak, garlic, olive oil, lemon juice and lemon peel in a plastic zipper bag and marinate for at least an hour, and up to overnight. Turn on grill to high. Grill steak for 5 minutes per side for medium rare, or to your liking. Remove steak to a cutting board, tent with foil and let it rest while you grill the scallions. Toss scallions with olive oil and lay across grill grates. Grill, turning now and then, until char marks start to form – about 5 minutes or so. Slice steak across the grain. 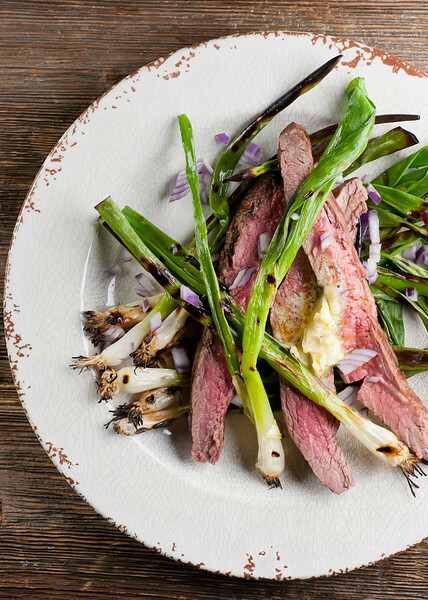 Divide steak among dinner plates and top with scallions. Sprinkle with red onion and sprinkle with salt and pepper. If you are feeling extra fancy, put a small spoonful of butter on top of each plate and dig in! OMGee Kate! This is the meal of my dreams! Juicy beef and grilled scallions would be the meal I’d choose over just about any other. Simple, yet so savory and delicious. And a nice dollop of butter, perfect! Thanks for sharing and have a great weekend my friend! Ahhh, we make something just like this that my husband adores! I don’t eat much red meat, but we’ve been pairing flank steak and scallions for years now (starting on a George Forman grill when we were living in an apartment). Love that sound of your marinade with the lemon and red onions, and I know my husband will want to try it with the pat of butter on the steak. YUM! Grilled dishes are so tasty and so much fun! This platter looks so rustic and delicious. Grilling always intimidates me, especially grilling steak. I’m always afraid I’ll mess it up somehow. But this looks so good! I might have to take the plunge again sometime. ??? ?